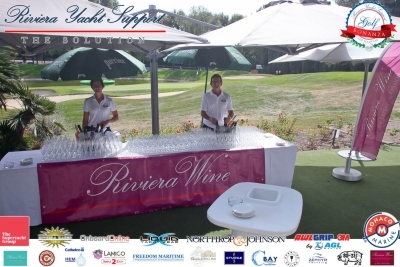 THANK YOU for making the 9th Riviera Yacht Support Golf Bonanza a success! 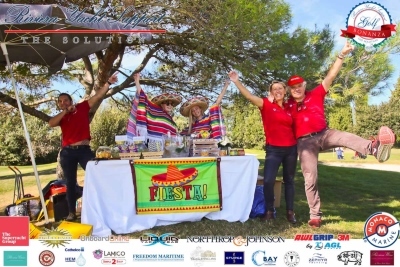 Riviera Yacht Support would like to extend our thanks and appreciation to everyone who attended our RYS Golf Bonanza on Friday 5th October at the Grande Bastide Golf Course. 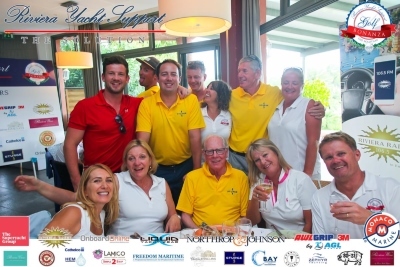 The 9th Riviera Yacht Support Golf Bonanza was another success with 120 participants enjoying perfect weather at the Grande Bastide Golf Course. 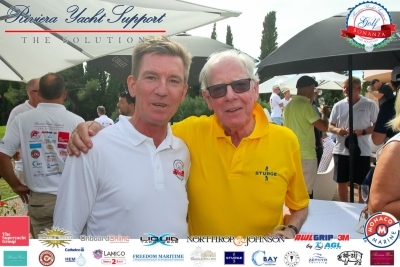 From our Riviera Yacht Support staff members putting up Sponsor signage and bars around the golf course, to the Sponsors and participants who took time out of their busy schedules to attend, to the staff at the Grande Bastide, to the drivers who transported everybody to and from the event - THANK YOU! 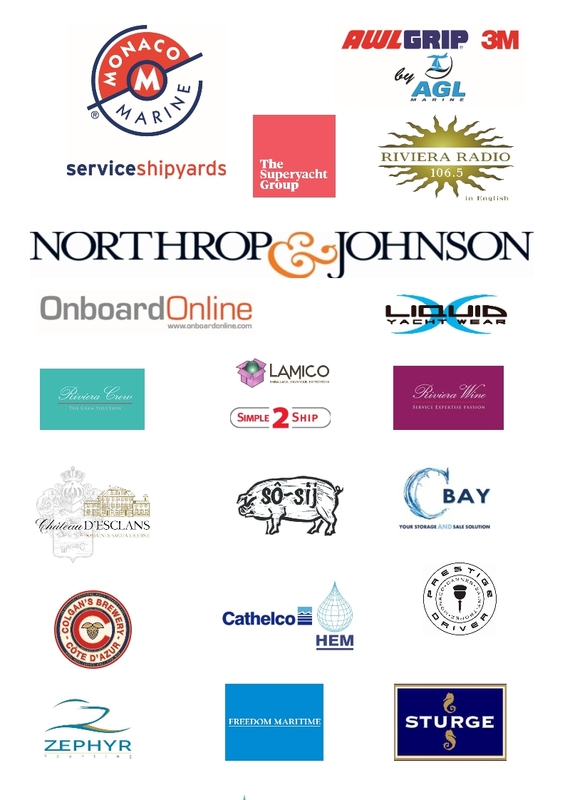 Without a doubt, the success of our annual event would not be possible without the support of our valued Sponsors. 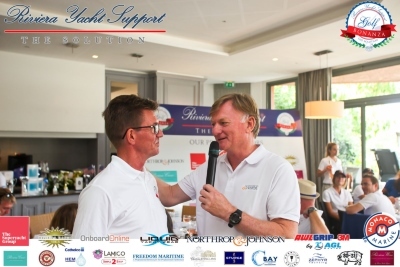 We were very happy to have The Superyacht Group join us as main Media Partner (as well as sponsor the 'Beat the Pro' challenge at Hole number 5) and Riviera Radio as our Radio Partner, with additional media coverage from Sam Watson and the team at Onboard Online. Complimentary transport left from Port Vauban at 7am with many attendees opting to find their own way to the Grande Bastide Golf Course. The day kicked off with a full English breakfast (supplied by one of our Silver Sponsors, So-sij) and briefing about the day's proceedings, with a shotgun start for 18-holes of golf just after 8.30am. 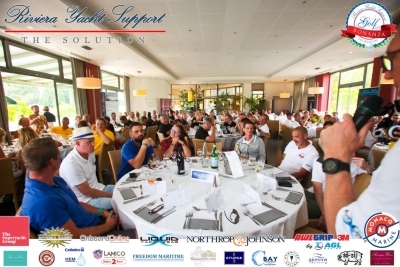 Gratitude extends to our Championship Sponsor, Monaco Marine, who have supported our golf event since inception and bring a lot of yachting expertise and fun to our annual golf day! Northrop & Johnson joined us as a new Sponsor this year and we were thrilled to have them on board, where their highly-regarded reputation in the industry added to a fine calibre of Sponsors. 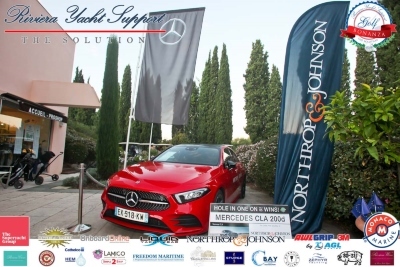 Sadly, no one claimed the beautiful red Mercedes that N&J sponsored - better luck next year! Our remaining Silver Sponsors for this year's event included Prestige Driver (private transfers), Riviera Crew, Lamico / Simple2Ship, Colgans Brewery and Riviera Cbay (all manning refreshment stands / bars around the golf course) and Liquid Yacht Wear, who sponsored the stylish polo shirts printed with all Sponsor logos that were handed out at morning registration with a fantastic goody bag. 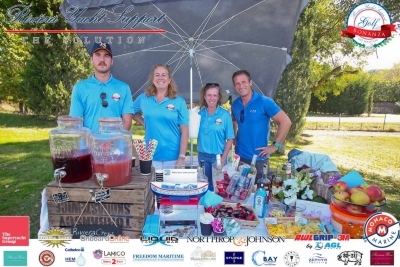 After a warm morning on the fairways and greens, attendees were greeted with chilled Champagne and wines at the 19th-Hole, kindly provided by Château d'Esclans and Riviera Wine. 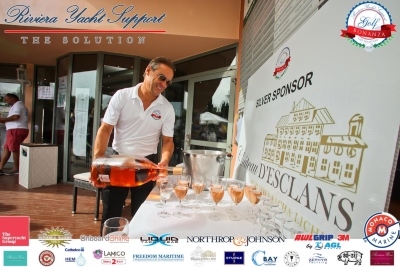 The 19th-Hole reception is a relaxed opportunity to share a few drinks and network with other yachting professionals. 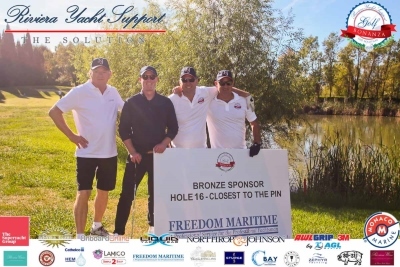 During the day, our Bronze (Hole) Sponsors included a few challengers hitting some big yards out on the fairways - thank you to Riviera Cbay, Zephyr Yachting, Freedom Maritime, Hem / Cathelco and Sturge for your continued support each year. 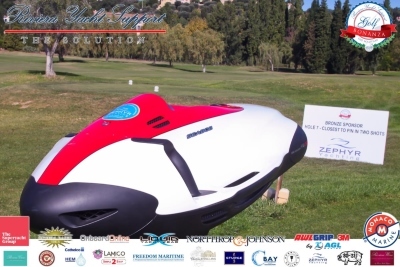 - Riviera Cbay's silent auction and wondering who scooped up some great deals! - Jonny from The Superyacht Group sprinting across the golf course to get to the group photo! After 19th-Hole drinks, we convened for the group photo and headed to the clubhouse for a well-deserved lunch. Ulf took the opportunity to introduce the Sponsors for the day and convey their importance in making the event a success every year. Service was superb from the Grande Bastide staff who kept the drinks flowing - we enjoyed a salmon/avocado starter, roast lamb shanks with vegetables and mash (or mushroom pasta for the vegetarian option) and a chocolate fondant sponge for dessert, followed by coffee. Prize giving was highly anticipated and got the pace going due to the fabulous MC'ing by Norma Trease, who knows how to get a party started! A selection of mini BOSE speakers (courtesy of Mark Rudd Marine and wine from E3 Systems, presented by Monaco Marine) was awarded to the 'BEST TEAM', The Beer & Bacon Cricket Club. 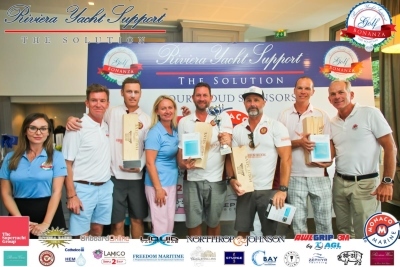 The 'BEST GENTS' prize went to Ben Lewis who picked up a Fitbit & Champagne sponsored by Riviera Crew for his efforts, 'BEST LADIES' was claimed by Corinne Bazin Conzales who won a luxury stay at the 5-star Mas Candille and 'BEST DRESSED TEAM' was awarded to the crew from M/Y Kingdom who took home some cases of fine craft beer courtesy of Colgans Brewery. 2ND BEST TEAM went to AGL Marine 1 who won 4 Tandem Paragliding vouchers, donated by Riviera Yacht Support and presented by AGL Marine. 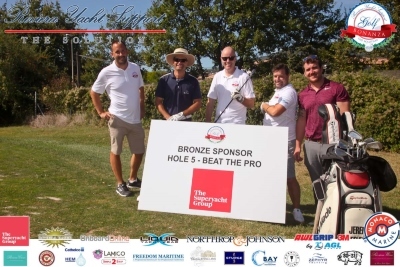 3RD BEST TEAM was awarded to Bonanza regulars - Frozzie Golf - who picked up dinner for 4 thanks to Michelangelo restaurant in Antibes and presented by Northrop & Johnson. 2ND BEST LADIES was claimed by Dairine Williams from Sturge who will experience a 'Fantastic' beauty package worth €400, thanks to The Cutting Shop by Marc Ramo and presented on the day by Northrop & Johnson. 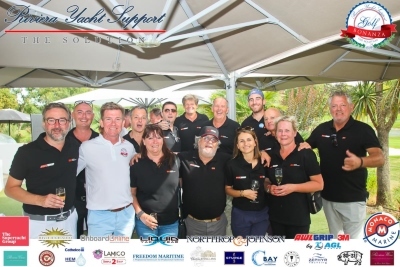 2ND BEST GENTS and an awesome prize of a drone donated by YachtNeeds (and presented by AGL Marine and Michael Payne from N&J) went to Captain Kane Gall from M/Y Maraya. 3RD BEST GENTS was presented by Simple2Ship and the winner Hermanus Kriel won 2 golf bags and 9-holes with golf pro, Jérémie Felenc. 3RD BEST LADIES was awarded to Gilly Pearson who picked up a one-year luxury concierge membership thanks to ZAND Concierge as well as some fine wine, presented by Riviera Crew. 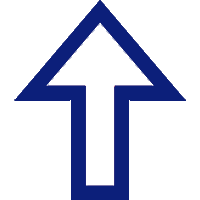 LONGEST DRIVE is sponsored by HEM/Cathelco and is a hotly contested hole on the day and the one that brings out the big hitters! This year, the mens winner was Camille Pelletan from Nautech Group and ladies winner was Emma Orr from So-sij. They won a fantastic driver experience in a Ferrari and Lamborghini! CLOSEST TO THE PIN was presented by Freedom Maritime and the gents winner was Steve Osborne, Captain from M/Y Slipstream, who won a weekend in a Mini courtesy of Elite-rent-a-car. The ladies winner was Laura Sturge who went home with a True Grace gift set, kindly sponsored by Shalene Hutchinson Luxury Toiletries. CLOSEST TO THE PIN IN 2 SHOTS offered up some great prizes including a putter and golf balls for the gents winner thanks to McFarlane ShipDesign, as well as Champagne 'Tea Time' at the Belles Rives for the ladies winner. 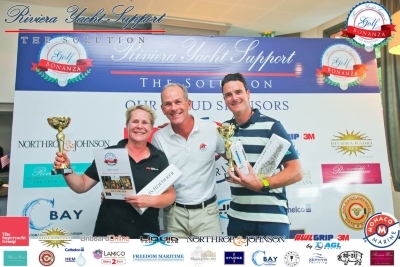 The gents winner was Nick Dolphin, Chief Officer from M/Y Phoenix 2, and ladies winner was Maria Carr who collected their prizes from Zephyr Yachting. 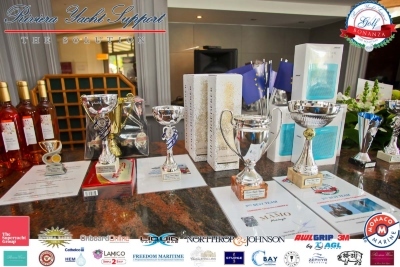 The Grande Bastide contributed the prizes for the CLOSEST TO THE LINE winners - 2 x green fees and lunch. 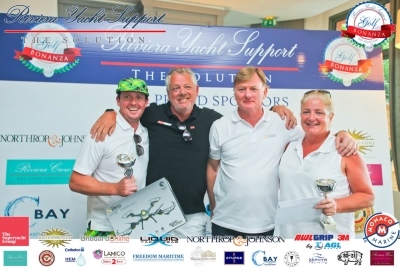 Presented by Riviera Cbay, the winners were Malcolm Green (Chief Engineer on M/Y Yalla) and Laura Sturge. 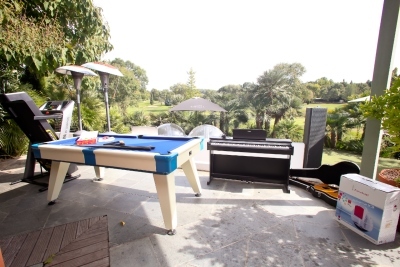 We have two super fun challenges during the Golf Bonanza - the 'BEAT THE PRO' competition takes place at Hole number 5 where each golfer takes on golf pro Jérémie Felenc and has to get closer to the hole than him to win. 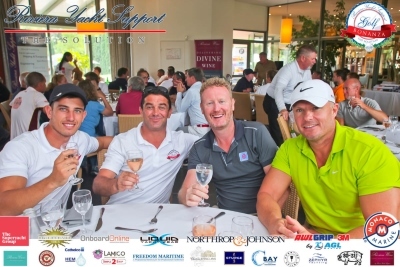 This year, 9 fortuitous golfers beat Jérémie and claimed a bottle of wine, generously donated by OnboardOnline! Our other challenge (which is harder than it looks!) is the 'FLOATING TARGET' at Hole number 17, proudly sponsored by Sturge. Every golfer who hits the floating green is a winner - this year, 17 people came up trumps! A day at the Grande Bastide Golf Course goes well for some; and for others there is the award for 'WORST PLAYER'. We gave an 'A' for effort to Sarah Lycett from Riviera Radio who walked away with a one-hour session of osteo and acupuncture courtesy of The English Osteopath along with 9-holes of golf with golf pro, Jérémie Felenc. 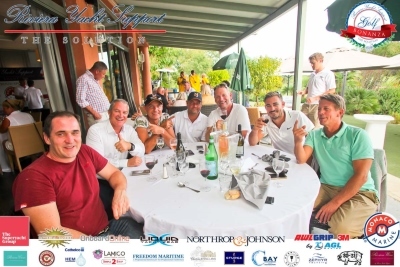 Our 9th Golf Bonanza had a special RYDER CUP-STYLE theme and at the end of tallying the results, the top 10 scores from either 'Europe' golfers or 'The Rest of the World' golfers took home a fine bottle of Champagne. On the day, the 'Rest of the World' soared to victory! Official photos from the day (thanks to Riviera Yacht Communication) are now viewable on the Riviera Yacht Support Facebook page - simply click on the blue button below to go to the photo album. Please feel free to tag us and share your photos with us on social media; you can use hashtag #GolfBonanza2018 on Facebook, Twitter, or Instagram. Video coverage, courtesy of Visuality Production, is uploaded on Facebook, LinkedIn and our YouTube channel. We have a couple of 30-second teaser videos, a 2-minute long highlights video and a longer 10-minute video featuring interviews with main Sponsors! 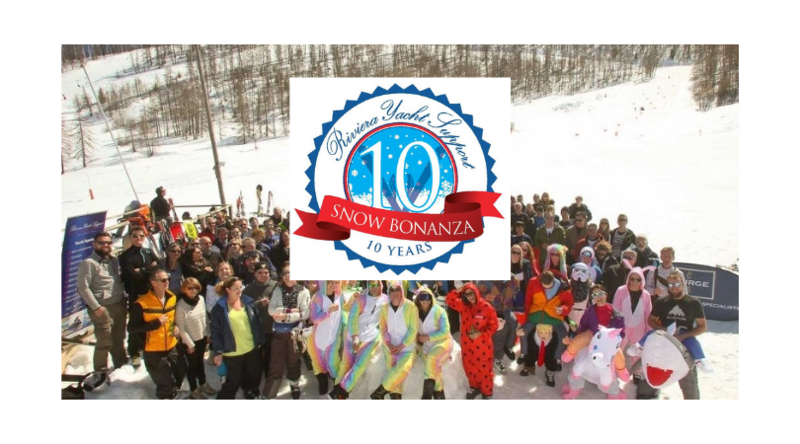 Next year marks a decade of Golf Bonanzas! We will be planning for an unbeatable 10th Anniversary special and look forward to having you all back again in 2019! 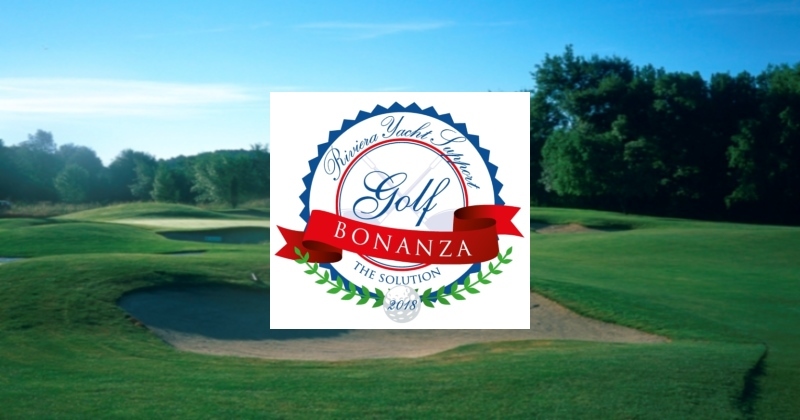 CLICK HERE TO SEE THE 2018 GOLF BONANZA PHOTOS ! 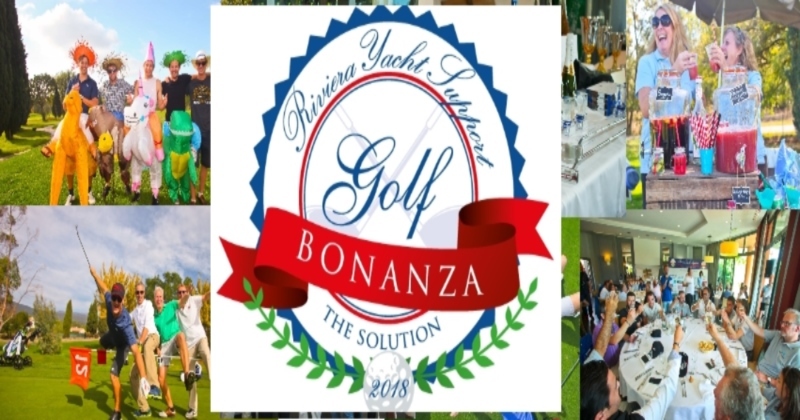 JOIN the Riviera Yacht Support Golf Bonanza 2018 ! 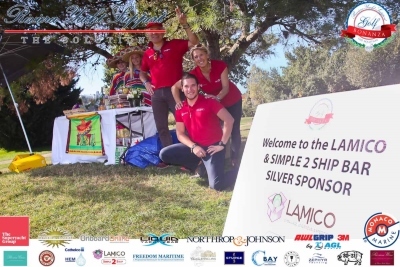 Meet the 2018 Golf Bonanza Sponsors !